When five-year-old Chloe couldn’t shake what appeared to be gastro, her parents took her to their local emergency department. Chloe was checked by the doctor and diagnosed with an ear infection, but suddenly her condition began to deteriorate. She couldn’t open her eyes and became unresponsive. Chloe was immediately placed in an induced coma and intubated overnight while her anxious parents, Matt and Katie, waited for her to be transferred to Sydney Children’s Hospital, Randwick. 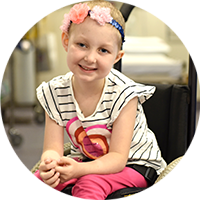 When Chloe arrived at our Hospital she was taken straight for a CT scan. The ear infection had spread to her inner ear and into her brain. It had caused pressure and swelling that was so severe she needed urgent surgery to remove the entire left side of her skull cap. Matt and Katie were told to prepare for the worst. “That first night was the longest of our lives, but we knew there was no better place for our little girl,” Matt told us. Distraught at the thought of losing Chloe, they spent the next 14 days by her side in our Intensive Care Unit (ICU). After an agonising wait, the expert ICU team finally managed to wake her from her coma. Eventually, she started to breathe on her own and was moved to the Neurology ward. Slowly Chloe began making progress and the swelling in her brain reduced enough for the missing piece of her skull to be replaced. There was a strong chance Chloe could have suffered complete hearing and vision loss, but she defied all the odds. Matt watched in amazement one day as Chloe chatted with her mum on the phone! Our dedicated Physiotherapists worked with Chloe every day and eventually she could sit upright by herself, and with assistance, even walk. Soon Chloe’s progress gained more momentum as our Occupational Therapists helped her to get ready to return to school. After five long months in Hospital, Matt and Katie were finally able to take Chloe home. They were thrilled to have their daughter back with them again. Chloe was treated by many different teams across the Hospital; from the ICU and Neurology ward, to Rehab2Kids. They all worked together to ensure Chloe got the very best possible outcome.